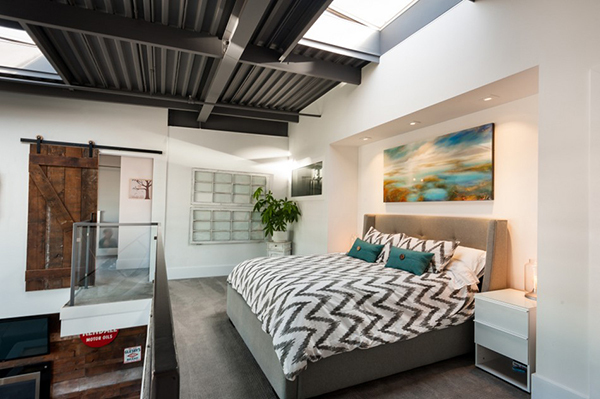 When a home is double-height, it means that the ceiling is much higher than the usual height of a home’s interior. Most spaces that are like this would accommodate large windows on the upper area of the wall or even a mezzanine. 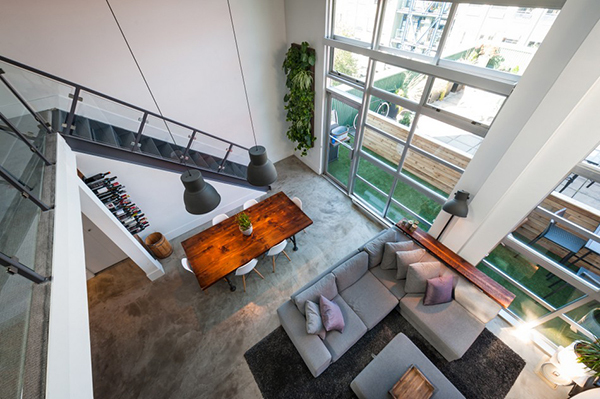 What we are going to show you today is the interior of a loft apartment with a double-height interior. But that’s not all. 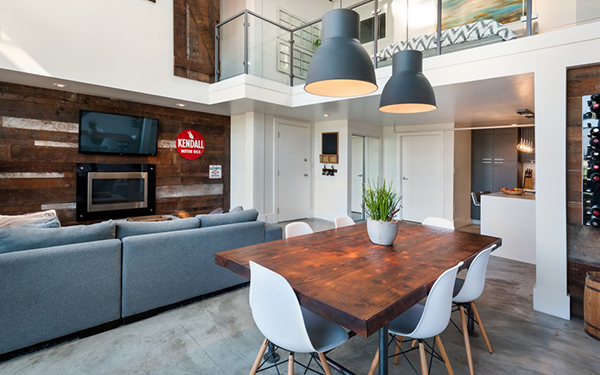 It has a beautiful vintage modern design with industrial elements that made it a sweet and cozy home to live in. 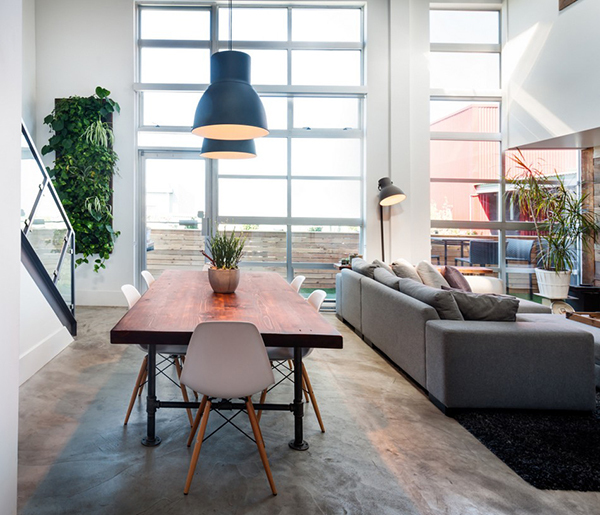 A Vintage Modern double-height loft in Vancouver’s industrial loft land is up for a renovation as owners Katie and Jordan Macnab eyes for a better interior as they were expecting their first child. But they would do the child-proofing after giving birth. 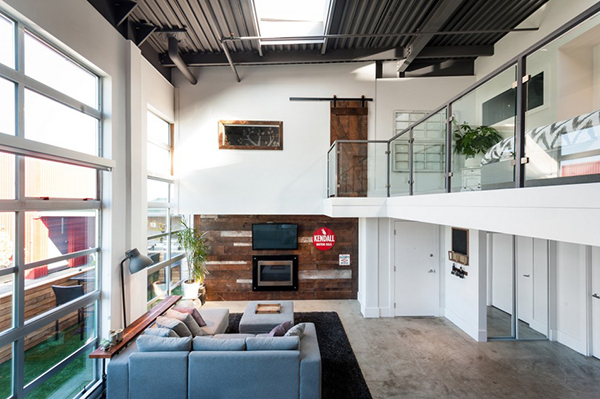 For now, they wanted to have a cool home while retaining the industrial features in this space of the Mecca loft building located in Mt. Pleasant, Brewery District. It has two bedrooms, two bathrooms, a roof top patio, a secret door to a hidden office and a view of the Grouse Mountain. The interior of the loft has a double-height ceiling with glass windows. 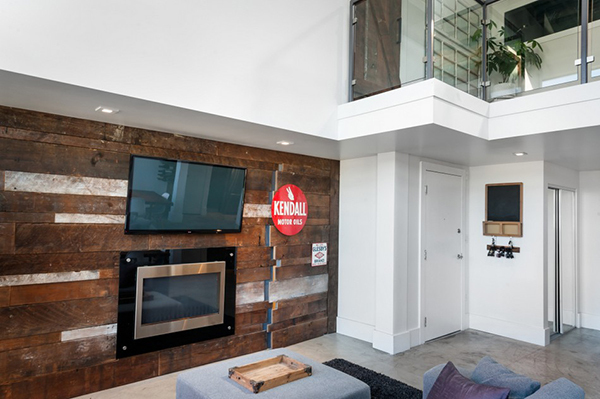 It used reclaimed wood for this living room’s wall as well as other wooden elements too. Industrial light fixtures from Ikea were employed in the house. It has exposed beams and roofs too. 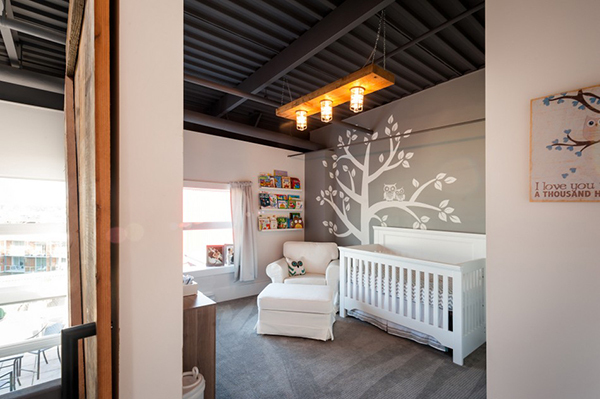 Since the owners were expecting a baby, they have a nursery in the house with a white tree and owl decal. In the loft you will find the master bedroom. I love shutters used as wall decor on one side of the wall. 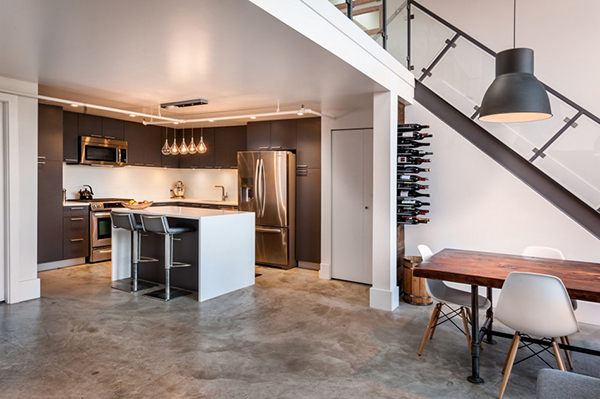 The floor of the apartment is original polished concrete from 1995. 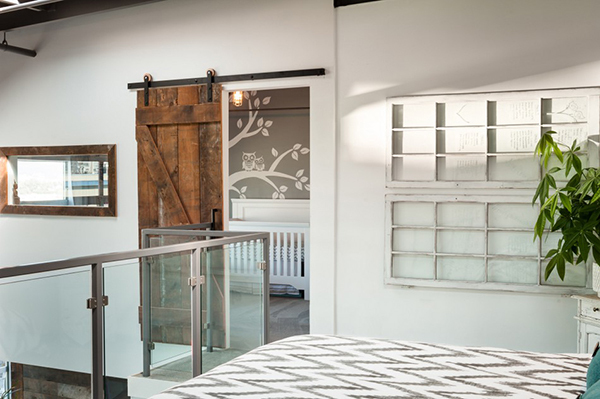 It used a barn door that leads to the nursery in the loft of the apartment. A closer look at the wooden wall in the living area that has a television and modern fireplace. That barn door that leads to the nursery is just so cute!. The kitchen is just near the dining area. Under the stairs is a small wine storage. The kitchen is just small but functional. 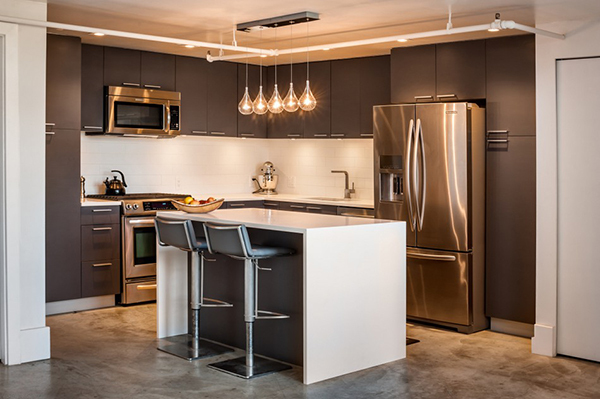 It has a sophisticated aura with a small kitchen island. The loft was designed considering functionality of every space. It was designed by the owners who work on their own studio named The Macnabs. 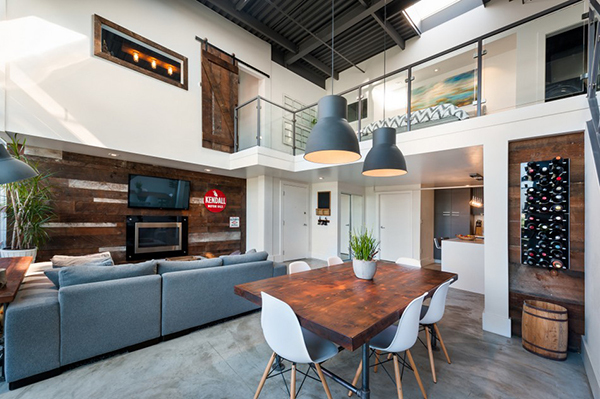 This 1350 sq/ft loft used a white on gray color scheme that matched well with the reclaimed barn boards in the interior. We love every detail of this apartment! I especially like the fusion of vintage, modern and industrial elements!